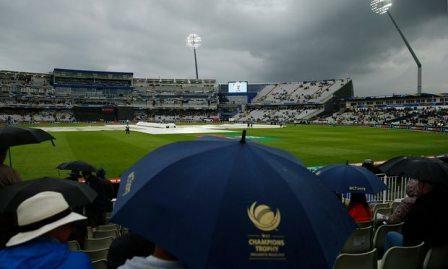 Steve Smith did not mince his words after Australia’s Champions Trophy opener with New Zealand ended in a rain-ruined no result, tearing into his bowlers for an “ordinary” display and admitting the weather in Birmingham had seen his side “get away with one”. Smith’s world champions were certainly wobbling when a third spell of rain at 5.55pm saw this Group A encounter finally ended, with their pursuit of an adjusted target of 235 from 33 overs sitting at 53 for three by the end of the ninth after Trent Boult’s removal of David Warner was followed up by a two-wicket burst from the pacy Adam Milne. Kane Williamson’s classical 100 from 97 balls had earlier steered New Zealand to 291 all out in 45 overs after winning the toss. It was a total the Australian captain put down to an errant start from his seamers and one that could have been worse were it not for Josh Hazelwood’s career-best six for 52 – a haul that owed much to his opponents swinging late on. The point apiece plays into the hands of England, who after the eight-wicket win over Bangladesh at The Oval now need just one victory from their remaining two fixtures against the pair to seal a semi-final spot, starting against New Zealand in Cardiff on Tuesday. It perhaps was a sign of the times that when New Zealand’s innings ended with a record total against their trans-Tasman rivals in a global tournament, it still felt an underwhelming one, ending in a cascade of wickets and an over unused of their allotted 46 as they lost six for 37 runs in 35 balls of picking out men in the deep. Luke Ronchi’s happy-go-lucky 65 from just 33 balls – including two audacious lifted sixes in an assault on Pat Cummins – and a ninth one-day hundred from Williamson had given the lower order the license to swing. But with New Zealand sitting pretty on 254 for three at the start of the 40th over, something far grander had looked possible. Australia bounded into the interval feeling better themselves, following what had been a shabby display in the field at times and one that delighted the Edgbaston crowd. While Glenn Maxwell shone with four catches, Ronchi earned lives on 24 and 54 thanks to a bungled run out by Matthew Wade behind the stumps and a dropped catch by Mitchell Starc. Starc, who saw the ball after his error at mid on fly over his head for four, was one of the bowlers that Smith had referred to as rusty – a fitting description for the left-armer’s nine overs, none for 52 in which the white ball did not swing and New Zealand’s batsmen went untroubled. Starc’s lack of edge can be put down to his near three-month break following a stress fracture to the foot and his decision to miss the Indian Premier League. Australia still chose to hold back their most well-tuned seamer, James Pattinson, after his explosive spell at Nottinghamshire, preferring the worthy but less hostile John Hastings instead. Hastings picked up two wickets but was the bowler Williamson tucked into the most, with the 25 balls he sent down to the right-armer taken for 42 runs in a blitz of crisp cuts and mown slog sweeps on his way to three-figures. Having put on 77 with Ronchi and 99 with Ross Taylor (46), Williamson perished the ball after his century when run out after a steer to point. From there it all went the way of Hazlewood who, having earlier removed Martin Guptill for 16 by going cross-seam early, profited from New Zealand’s lower order trying to swing for the hills without giving themselves a sighter first. Boult at No11 was his one classical wicket – caught behind to make it three in four balls at the end – as he became just the second bowler in the history of the Champions Trophy to take six. Boult began New Zealand’s surge with the ball after a rain-extended interval, as Warner feathered behind attempting an uppercut on 18 in the fifth over. The pace of Milne then saw Aaron Finch chip to short mid-wicket and Moises Henriques offer a simple caught and bowled. Australia were suddenly up against it. But no sooner had that last wicket fallen, the rain came again and with it, ended what was set to be a compelling contest.